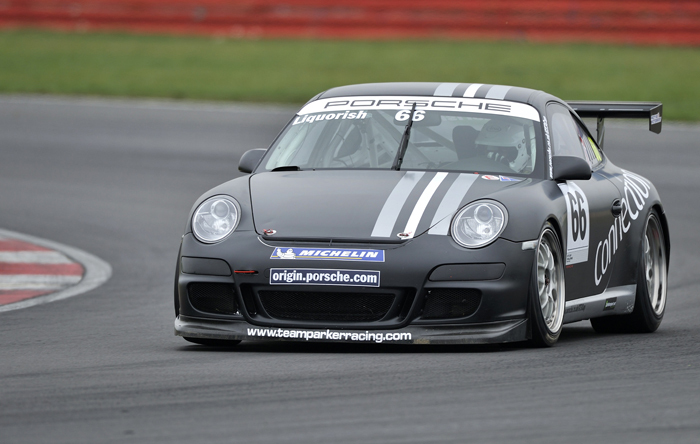 One of the sweetest names in Motorsport - See the Porsches roar into action at Donington Park this weekend. The glorious sweeps of the Donington Park circuit in Leicestershire are the setting for rounds three and four of the 2012 Porsche Carrera Cup GB. Another fine entry of 450bhp 911 GT3 Cup cars should deliver two more absorbing contests at a track that most drivers rate as one of their favourites. Right now, the early championship momentum is with Michael Meadows (Redline Racing). He was unfortunate to be denied a double win at Brands Hatch by a penalty and then set a blistering pace in testing at Thruxton last week. Now, Meadows heads to Donington with a five-point lead and he will be determined to press home his advantage. However, as the Carrera Cup celebrates 10 years with its youngest ever driver line-up in the Pro category, a gaggle of drivers will all fancy their chances to stopping Meadows taking all the glory. Second in the points is Jonas Gelzinis (Juta Racing) and he will fly at Donington. So too, will the Yorkshire youth squad from Team Parker Racing of Richard Plant (Sheffield), Sam Tordoff (Leeds) and Daniel Lloyd (Huddersfield). Plant scored a fine debut win at Brands, while Tordoff led a race at Donington a year ago and will surely shine. Then, Carrera Cup Scholarship driver Lloyd will also be a strong contender after a massively impressive start to his season. Ben Barker (Parr Motorsport) is another major title contender and showed his pace with a feisty recovery drive in the second race at Brands Hatch. He will expect to be challenging for the podium at Donington, while Glynn Geddie (Redline Racing) will also be eager to step up the order after, by his own high standards, a modest weekend at Brands. Rory Butcher (Celtic Speed) and Chris Dymond (Parr Motorsport) pack out an incredibly strong Pro category. Heading Pro-Am1 after two races is Ahmad Al Harthy (Redline/Oman Air) and he is set to be the benchmark once more at Donington Park. However, the Oman racer faces some tough opposition, including Oly Mortimer (GT Marques) who won the second race at Brands to show his potential despite very limited seat time to date. Derek Pierce and Michael Leonard race with Team Parker Racing and both are potential winners, with Pierce aiming to repeat his opening round victory. Pro-Am2 seems to be wide open at this stage and three drivers will head to Donington vying for a place on the top step of the podium. Will Goff (Goff Racing) and Tautvydas Barstys (Juta Racing) shared the wins at Brands, but Tania Mann (SIBSport) made a superb Carrera Cup debut and should build on that as her experience in the car grows. Daniel Lloyd continued his hugely impressive start to the 2012 Porsche Carrera Cup GB when he set the pace during testing at Donington Park Yesterday (Thursday 12th April) ahead of rounds three and four of the championship. Once again, the incredibly strong field set a fearsome pace at the East Midlands track and the top eight drivers ended the day covered by less than four-tenths of a second. While Ahmad Al Harthy (Redline/Oman Air) and Tania Mann (SIBSport) headed Pro-Am1 and Pro-Am2, Carrera Cup Scholarship racer Lloyd (JD Pierce with Team Parker) lapped three-tenths of a second under the lap record to head the overall times. For Lloyd it was the first time in his short Carrera Cup career to date that he had ended the day with the best lap, having run two laps in the 1m07.2s bracket in the afternoon session. “It’s been a mega day,” said Lloyd. “I’m over the moon to be P1 but I think there is a bit more to come.” Sam Tordoff made it a good day for Team Parker Racing by setting the pace in the morning test and he ended the day only six-hundredths of a second behind his team mate. “We had a good set-up from testing before the start of the season and I seem to go well here,” said Tordoff, who believes that a lap beneath the 1m07s mark could be the pole time in Saturday’s qualifying session. Ben Barker (Parr Motorsport) and Rory Butcher (Celtic Speed) both ran very strongly to wrap up the top four and mark themselves as major contenders, while Michael Meadows (Redline Racing) and Jonas Gelzinis (Juta Racing) made it five teams in the top six places. Meadows, the man who has generally set the pace to date this season, reported that he didn’t get a proper run on new tyres but he will surely be in the battle for pole position when qualifying starts on Saturday afternoon. Right in among the Pro drivers was Al Harthy, who topped Pro-Am1 with eighth best time overall. “The car was perfect and I’m happy with that,” said the Omani racer. “I’ll try and fight the Pros in the races,” he added. However, the strength of the Pro-Am1 pack was amply illustrated as less than a second covered the other six drivers in the category with Derek Pierce (JD Pierce with Team Parker) heading the pursuit of Al Harthy. “The car is fantastic,” said Pierce. “I was pleased to be only eight-tenths off the overall best time, but disappointed to be down in tenth place overall,” he added. Third in Pro-Am1 came from a strong performance by Victor Jimenez (Redline/Oman Air) with series returnee Karl Leonard (Parr Motorsport) well in touch in fourth. “That’s blown the cobwebs away,” said Leonard after his first proper day of running since the end of the 2011 season. In Pro-Am2, Mann worked away to find nearly a second between the two sessions and come within an ace of breaking the 1m10s mark. With Will Goff (Goff Racing) likely to miss the weekend due to business commitments and Tautvydas Barstys (Juta Racing) missing testing, Mann had the Pro-Am2 category to herself for testing. After qualifying at 14.40 on Saturday, round three will start at 10.00 on Sunday, with round four at 15.40 on Sunday. Round four will be broadcast live on ITV4 during the extensive BTCC programme.